Dressage saddles have become more and more extreme in their positioning of the rider, but is this actually conducive to good riding? In order to understand good saddle design, it's important to consider firstly what the saddle is there to do, and also what it is NOT there to do. The purpose of a saddle is as an interface between horse and rider that makes riding more comfortable for both individuals, whilst maintaining as close a connection as possible between the two. The tree is a fundamental concept in saddle design because it is a means of creating a space between the rider's seat and the horse's spine, whilst allowing the rider's weight to be distributed on either side of it via the panels. This avoids uncomfortable pressure for both horse and rider on the bony spinus processes, more or less prominent depending on the individual horse's conformation and condition. 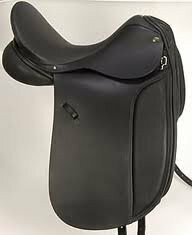 The saddle also provides comfort for the rider through the shape of its seat which is designed to correspond better to the human pelvic structure than the horse's back alone. Some support is also provided to the rider's seat by the raised pommel and cantle, the degree of which being one of the crucial questions of saddle design that we go on to discuss below. 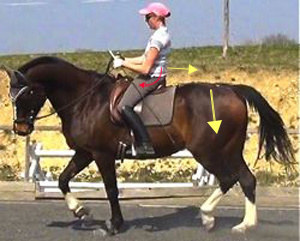 The stirrups are of course a major part of the support that the saddle gives to the rider, and in dressage they have an essential role in the development of the rider's leg position (see: Rider Biomechanics). 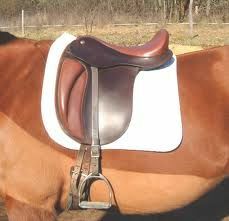 The positioning of the stirrup bars is, for this reason, very important to good saddle design: they should ideally be positioned far back enough as to be in line with the rider's seat bone, so that the leg can be correctly stretched under the rider's seat without the stirrup leathers having to be pulled back on an angle. Unfortunately in most saddle design the stirrup bars are positioned much too far forwards, and usually they are also recessed causing discomfort to the horse. One of the most important aspects of saddle design, especially that of dressage saddles, is the closeness and stability of connection between horse and rider. This is crucial to the rider's gymnastic influence over the horse, because all physical communication between rider and horse, apart from the lower leg aiding, has to pass through the interface of the saddle. This includes all of the leverage of the rider's seat, both longitudinally (tuck of the pelvis) and laterally (weighting of the seat-bones) - both fundamental to achieving engagement. How well the saddle transmits the rider's aiding to the horse, and equally the horse's movement to the rider, depends on the design of the tree and its fit to the particular shape of a horse's back. 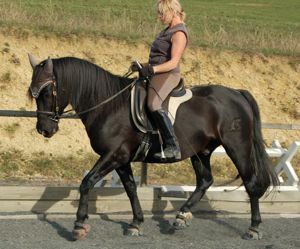 Good dressage saddles should be as close-contact as possible whilst maintaining sufficient clearance of the horse's spine, because the further the rider is lifted away from the horse's back, the more mutual transmission is lost, and the greater the possibility of displacement of the rider out of correct alignment with the horse. Good saddle fit is obviously essential for all saddles, especially dressage saddles, both for the comfort and freedom of the horse, and for maintaining optimal connection between horse and rider (click on the link for more about this). 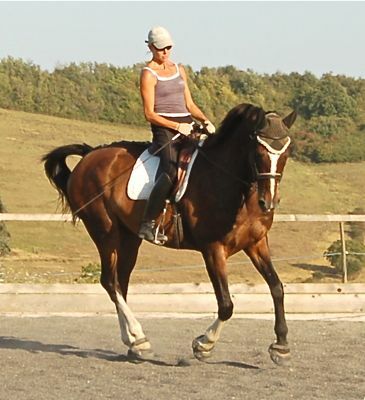 A good dressage saddle can maximize your connection with the horse, but it cannot hold you into the right position on the horse so that you don't have to make the effort to stay there yourself. Only your own muscles and the suppleness of your joints - achieved from years of hard work and determination - can do that. The saddle should be a platform that simply allows you the space to position yourself properly (photo, top right), however many modern dressage saddles have become precisely the opposite, fixing riders into the wrong position. 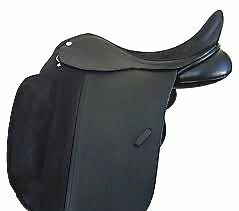 The design of modern dressage saddles has seen a great proliferation of the 'deep-seated' saddle, which in itself has become more and more exaggerated in certain saddle designs (photo, bottom right). It can only be assumed that this is due to a demand for more 'security' and support in the saddle, perhaps in correspondence with the wider availability of horses with increasingly extravagant movement. 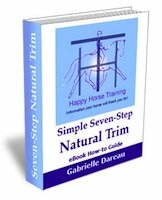 The problem is, however, that these deep-seated saddles, with extremely high pommel and steep cantle, fix the rider's seat into a position that has no potential for influencing the horse in the correct way to bring about engagement. The reason for this is that the rider must be able to rotate the pelvis onto the back of the seat-bones in order to create the leverage that in turn causes the horse's pelvic tucking and lifting of the back. 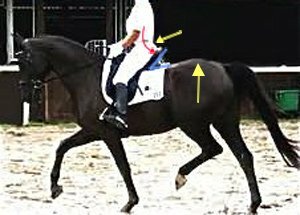 Riders who sit on such deep-seated dressage saddles are physically blocked from making this rotation of their pelvis by the steep wedge of the saddle's seat that rises up to the cantle. 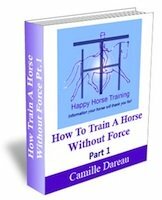 This forces the rider's pelvis to tilt forwards onto the pubic bone, positioning the seat-bones against the forwards flow of the horse's movement, and forcing the lumbar back - of both human and, as a consequence, horse - to become hollow and compressed. These two pictures show the difference between the deep-seated saddle that forces the rider into a fork seat with a hollow lumbar back (top photo), and a well-designed Strada dressage saddle (bottom photo) which allows the rider to correctly touch the pelvis, achieving the right alignment with the horse's back and connection with the movement. In terms of security in the saddle, the only thing that can give you that is a truly independent seat which is gymnastically engaged with the horse's movement. 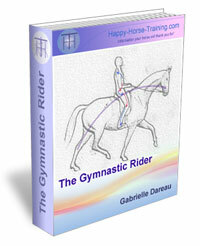 This comes as a result of patient strengthening and suppling of your body through correct riding. It has absolutely nothing to do with sitting in a deep trough of a saddle which, as described above, in fact only prevents you from developing a good seat. Incidentally, a horse who is calm and happy as a result of a healthy lifestyle is also a lot less challenging to the rider in terms of security in the saddle. Another product of the same philosophy of dressage saddles fixing the rider into place are over-sized knee or thigh blocks, sometimes of gargantuan proportions (photo, right), meant to hold the rider's thigh back in position. If, when you ride, your leg is only kept in place because it is pushed up against the knee block, then its position is serving absolutely no purpose in gymnastic terms, because it is not your own muscles that are keeping it in place and it therefore has no independence. Your leg only gains independence and effectiveness when you make the physical effort to keep it in position yourself. 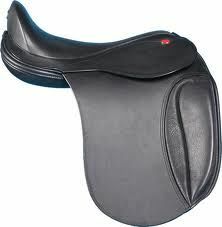 Which Dressage Saddles Assist Good Riding? We spent many years trying different dressage saddles in the quest for one that we felt truly fitted both our horses and our way of riding, until by great good fortune we discovered Strada Saddles. The first time we tried them we couldn't believe the amount connection and transmission with the horse compared to other saddles. 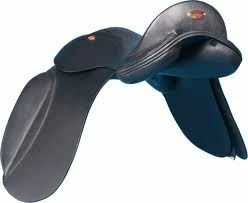 We only recommend them on our site because they truly are a great asset to both good riding and horse comfort. We have used only these saddles on our horses, of many shapes and sizes, for well over ten years with not one saddle-related problem. Not only do Stradas have a seat design that is basically flat, allowing the correct seat position, but their unique tree design, using carbon fiber and wood, gives unsurpassed fit to the horse. This is because the tree is not 'bent' into a hollow banana-like shape as so many dressage saddles are, but instead it sits flat onto the horse's back, with the thermo-reactive panels perfectly molding to the horse's shape. This is in fact one of the great disadvantages of traditional wool flocking in saddle panels: over time the flocking takes on the unevennesses of the horse who wears it, making it all the harder for the rider to address both their own and the horse's crookedness. Even with periodic re-flocking it is very difficult to ensure symmetry. Strada saddles have panels made of a specialist high-density foam that softens to a muscle-like consistency with the body heat of the horse, moulding to its shape, but always returning to their original symmetry. In the same way that in Holistic Equitation, everything fits together to create a positive circle that supports a fundamentally caring intention, a similar negative cycle happens when the underlying intention is ego-based. When dressage is about creating a superficial 'picture' in order to gain ever-higher scores and greater approval, then all of the equipment associated with it becomes tailored to that one purpose - including double bridles, spurs, and deep-seated dressage saddles. The rider who blocks the movement with a powerful bit also needs to block their seat against against it, because there is no transmission coming from behind to 'feed' and support the correct seat position. If instead you put your own feeling of balance, connection and unity first then you will instinctively know what equipment will support you in that instead of hindering you, and your horse will appreciate the difference too.